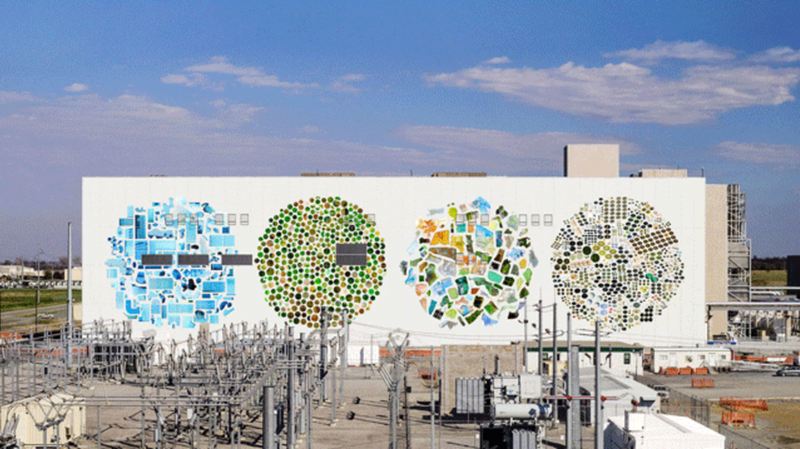 Data centers aren't usually known for being the most beautiful buildings in the world, and Google's were no exception—until they launched their Data Center Mural Project, which called upon artists to create lively exteriors to match the exciting technology happening inside, The Next Web reports. Massive data centers are where the internet lives, and Google has 15 of them around the world. For the project, they commissioned four artists to beautify centers in Iowa, Ireland, Oklahoma, and Belgium with eye-catching facades. The main objective of the art is to inspire people to think twice about how digital content reaches the computers and phones they interact with every day. "Because these buildings typically aren’t much to look at, people usually don’t, and rarely learn about the incredible structures and people who make so much of modern life possible," Vice President of Google Data Centers, Joe Kava, writes on the project's website. Two of the murals, one by Jenny Odell in Mayes County, Oklahoma, and one by Oli-B in St. Ghislain, Belgium, have already been completed. The Dublin, Ireland, and Council Bluffs, Iowa, data centers are next in line to receive makeovers, and after that Google hopes to expand the project to more of their locations around the world.